On many of our bigger western rivers fishing from a drift boat is advantageous for many reasons. Many people including myself enjoy wading. Nothing like feeling the water around you, the temperature, the sound, seeing fish rising around you. There is something indescribable about being in the river. It's a great day when you've been able to cover a piece of water completely and giving yourself every opportunity to catch fish. But many of our major rivers are better suited for fishing from a drift boat. There are many advantages to using a drift boat to fish. One big advantage is comfort. Fishing from a drift boat allows you to bring a wide array of extra equipment with you. Rain jackets, extra rods, warm clothes, cameras and personal belongings are never far away. Another great reason is that you don't have to fight the current or the river bottom. Many of our freestone rivers are not the easiest to manage. Wading around in various depths of water on greasy, rounded rocks on the river bottom will test even the most proficient wader. Do you have a tendency to catch more than just fish on your back cast? Fishing from a drift boat will eliminate any obstacles such as tree's, willows, or the shore from impeding your back cast. What is your casting ability? 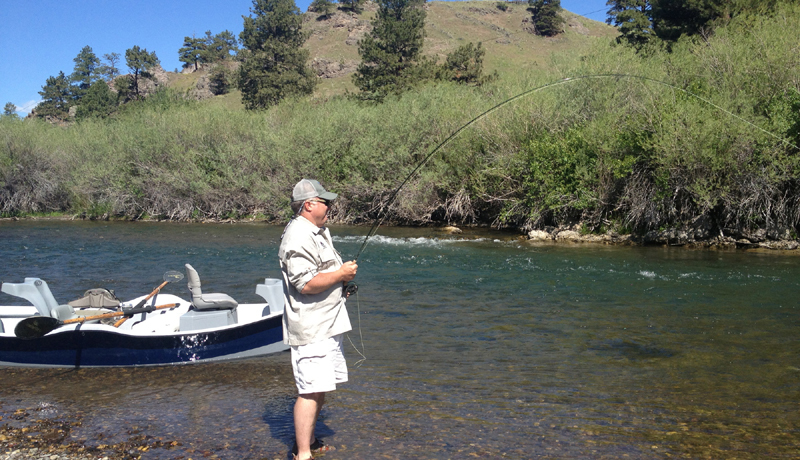 I feel, even with rookies that after some coaching they should be able to make a 20-25 foot cast consistently. The guide can position the boat so that everyone can reach the juiciest water. When wading you will have to make a variety of different distance casts from 15-45 feet to cover the water effectively. Which for different anglers can be troublesome. When wading, we may cover 1/2 mile to 1 mile in a full day. When floating, depending on river levels and time of year we cover around 5-15 miles in a day. With our rivers full of wild trout float fishing gives you a plethora of chances to hook and land many trout. Another great option about float fishing is that you can access side channels and areas that wade fisherman cannot get to. It is not uncommon that we fish our way down to good wading spots and then spend quality time in certain productive areas. In conclusion, when fishing our larger western rivers don't be hesitant to use a drift boat as a great tool to help you get the most out of your day.